Half board – breakfast and three course evening meal with wine . Hotel Mecina is a charming friendly, family run hotel with a pool set in extensive gardens and surrounded by tranquil little hamlets and mountain scenery. Trips to Granada, the coast and nearby villages can be arranged. A deposit of £100 a person is required upon booking. The balance for the course is due eight weeks before commencement. An administrative cost of £50 per person will be levied on all cancellations. For cancellations four to eight weeks before departure, a charge of 40% of the total cost is payable; two to four weeks 60%; one to two weeks 80%; less than a week 90% and once course has started 100% is payable. 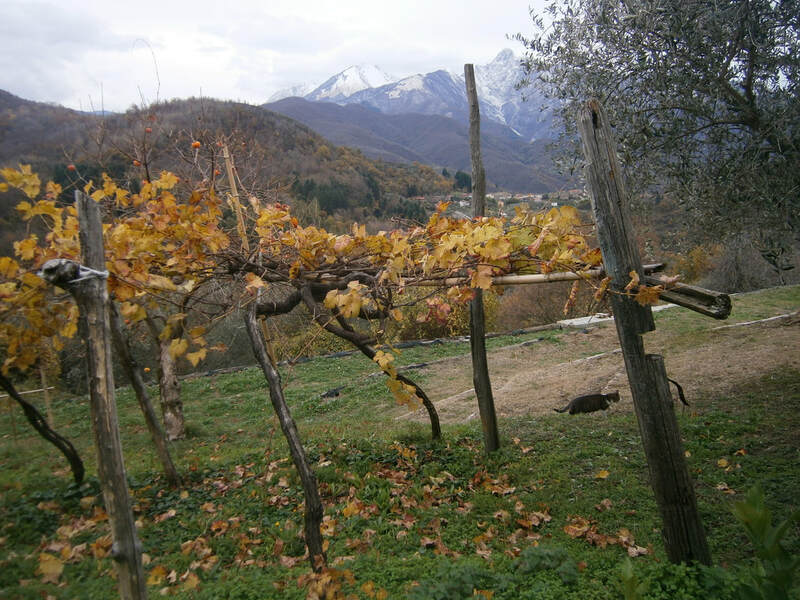 Terenzano is a small working agricultural village overlooking the spectacular Alpi Apuane mountains of Carrara in the most Northern part of Tuscany. The romans called this lunigiana because of the luminosity on the marble reflected by the moon. The village is about a ten minute drive from Fivizzano a small lively market town running many cultural and food events during the summer months. Also we can visit the Cinquiterre coastline by train or Lucca, a historic town to the South and East of Pisa. The accomodation 'Il Vecchio Frantoio', ' The old Olive Press , is a collection of old architectural buildings reconstructed to provide a venue for painting , walking and writing. Up to seven people can be accomodated . 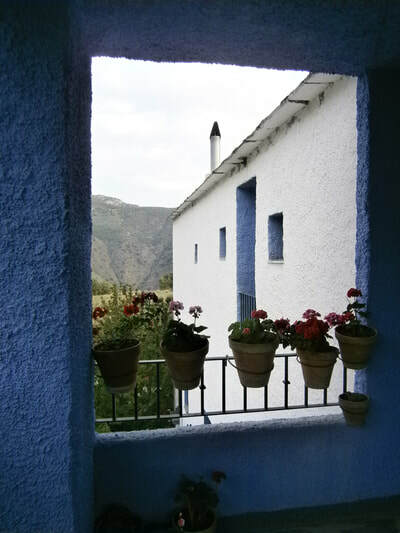 there is a large upper terrace where we can paint and a lower one on the edge of an olive grove with a plunge pool. Day 1 - Travel & Orientation Day Fly in mid-afternoon London Gatwick to Agadir, arriving for supper. After collecting hold baggage (if you have any) go to get currency (NB this is the same rate as everywhere inside Morocco, vastly better than rates if you buy at home) – either use the bank booths or use your card to an ATM in the arrivals hall. You must do this BEFORE going out to meet the drivers outside the door of the airport. 50 minutes transfer time to Taroudant. Day 2 - SUNDAY Morning: on the roof terrace: painting and sketching workshop. 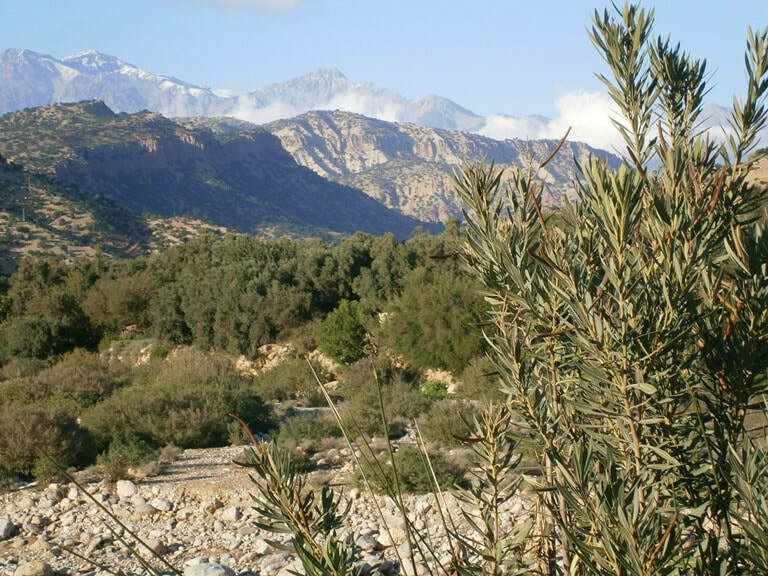 Afternoon: Orientation walk of Taroudant and visit Palais Salam to draw. 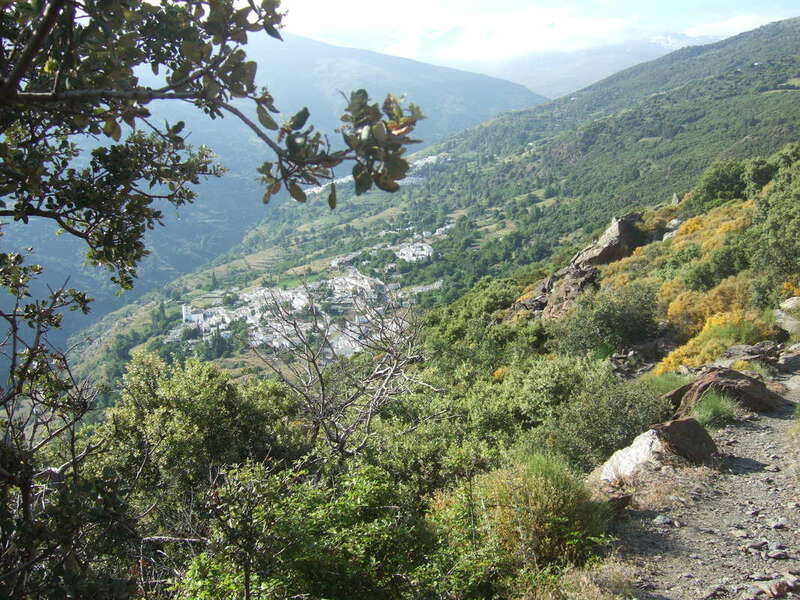 Day 3 - Option Excursion: Taliouine, the saffron capital of Morocco, in a stunning mountain range Jbel Sirwa (see image below- made of ancient volcanic rocks), with a lovely kasbah and a spectacular Agadir and the saffron crocuses will be in bloom (timing depends on weather). 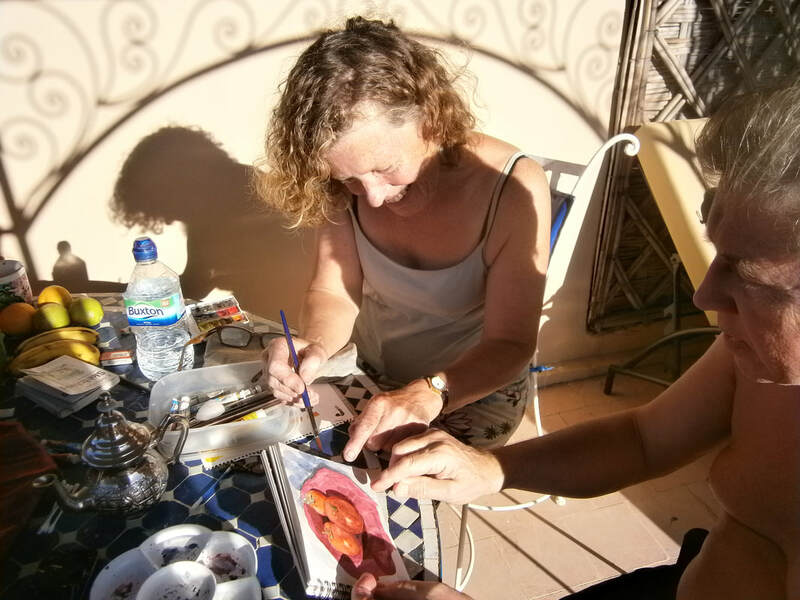 Day 4 - Taroudant – Louise’s Day Off. Option hammam “spa” treatment Moroccan style. Option to swim at the Olympic Pool on the edge of the town (entry fee very moderate) & shop in the souk. Day 5 - Excursion: High Atlas around Afensou with painting and drawing Option picnic. Day 6 - Option: am visit to the palace of Claudio Bravo, the famous Chilean artist. Includes museum and gardens with lots of opportunities to sketch. Entry fee 200 Dh each plus shared cost of transport (15 mins’ drive). Option: picnic. 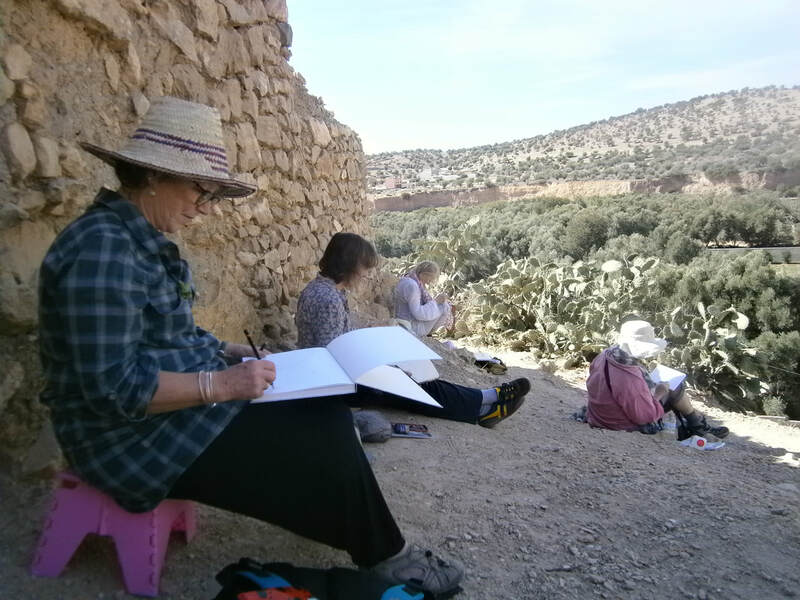 Day 7 - Excursion: Tiout Oasis with time to paint/ draw around the oasis and kasbah, visit to the women’s argan oil cooperative. Pay bills for extras. A new venue for this art holiday, in the villa where Matisse lived , with beautiful gardens and two studios . Visits to nearby Chapelle de Rosaire designed by Matisse and the Maeght collection of Modern art.